Robert Francis (Robbie) Williams was born in Tongwynlais and grew up in Cardiff. One of 17 children he worked from the age of 14 at Cardiff Docks. His first appearance for Cardiff came in 1909 and the following season he made 30 appearances as fullback. In 1914 he was elected captain of the side for 1914 – 5 but war deprived him of the honour. 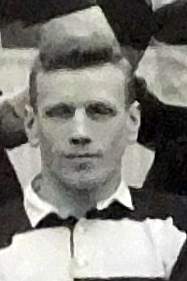 Williams returned to rugby after the First World War still playing for Cardiff until the end of the 1919 - 20 season, ending his club career with 159 appearances. An international against South Africa in 1912 marked his international debut and he gained four caps for Wales in all. The week after his international bow he was playing against the tourists again, this time for Cardiff. Williams played twice for the Barbarians in 1915 both games against Leicester.